HD Kumaraswamy took oath as the 24th Chief Minister of Karnataka in a power-packed swearing-in ceremony at Vidhan Soudha in Bengaluru which was attended by the who’s who of anti-BJP opposition leaders from across the country. 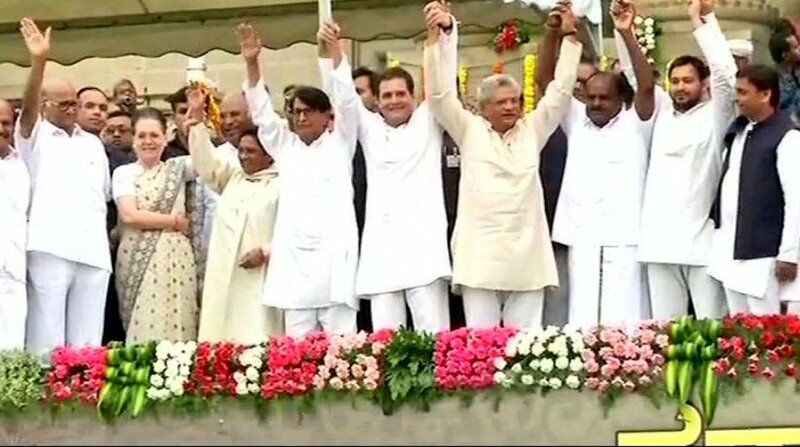 Amid exchange of handshakes and namaskars, embraces and victory signs, the informal ‘secular alliance’ from the all corners of India presented the biggest ever show of strength in India’s politics since the arrival of Prime Minister Narendra Modi to power. Kumaraswamy, whose party JD(S) formed an alliance government in the state with the Congress, took the oath administered by Governor Vajubhai Vala. While the JD(S) have 38 seats with ally BSP, the Congress have 78 in their bag. G Paramweshwara, the Karnataka Pradesh Congress Committee (KPCC) chief, took the oath of office of the deputy Chief Minister of Karnataka. His name was finalised after a hectic round of meetings between the leaders of the two parties on Tuesday. But the highlight of the ceremony was the presence of India’s biggest political names who attended the swearing-in to send across the message of a united national opposition against the BJP – the party which has bested most of them in election after election in various states. 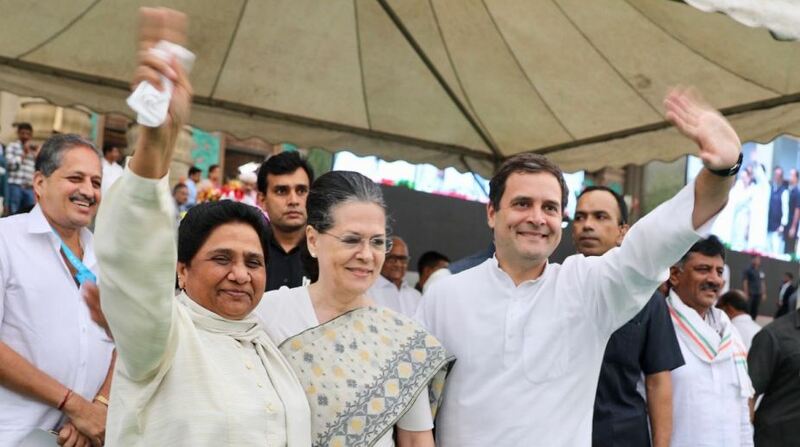 Mayawati, the BSP supremo, was seen beaming as she hugged and held the hand of UPA chairperson Sonia Gandhi as the two leaders engaged in a conversation like long lost friends reunited. The BSP had withdrew its support to the UPA I government in 2008. While Congress president Rahul Gandhi joined his mother and the BSP chief, RJD leader and son of Lalu Prasad Yadav, Tejashwi, hobnobbed with former Uttar Pradesh chief minister Akhilesh Yadav. Yadav was seen sitting next to Mayawati. 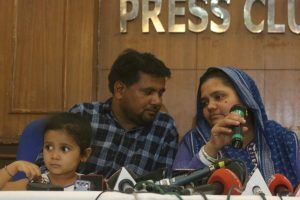 Ironically, their respective parties have been the bitterest of rivals in Uttar Pradesh before they formed an understanding of sorts to take on the BJP in Gorakhpur and Phulpur by-elections. West Bengal Chief Minister and Trinamool Congress chief Mamata Banerjee met nearly every leader present on the occasion. She personally presented a bouquet to Kumaraswamy after the swearing-in. TDP chief and Andhra Pradesh Chief Minister N Chandrababu Naidu, who was an ally in the NDA government till a few months ago, Delhi CM Arvind Kejriwal, Kerala CM Pinarayi Vijayan, CPI(M) general secretary Sitaram Yechury, KC Venugopal, Mallikarjun Kharge, HD Revanna and DK Shivakumar were among those who were present on the occasion. DMK leader MK Stalin was expected to be present but cancelled his visit so that he could visit Tuticorin in Tamil Nadu, where 12 people have died since Tuesday’s violence. Actor-turned-politician Kamal Haasan, too, did not attend the event. All of the leaders present on the occasion clasped each others’ hands and raised them in the air before a huge gathering of their supporters who arrived at the venue to witness the ceremony despite rain beating down on the city. In the new government, Congress’s Ramesh Kumar, a former minister, will be the next Assembly speaker, while the deputy speaker’s post will go to the JD(S). The Congress will have 22 ministers and JD(S) 12, all of whom would be sworn-in after the floor test slated for Friday. Kumaraswamy was the second Chief Minister to take oath in Karnataka within a week, after BS Yeddyurappa stepped down without facing the floor test on 19 May in the face of an imminent defeat in spite of his party winning 104 seats.